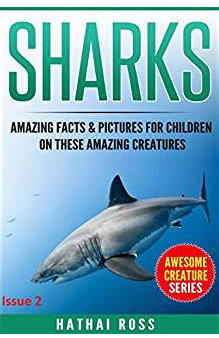 The author has written a simple reference book that will provide young readers with the essential facts on these fascinating sea creatures. Hathai begins with a history of sharks, pointing out to young readers that they existed before the dinosaurs. She includes a few simple photos to illustrate fossil remains. In the next chapter, Ross discusses anatomy and function. Ross provides a quick glimpse of different types of sharks and their special qualities like electrical sensors, and an exceptional sense of vision, smell, and hearing. Before concluding, Ross tries to convince her readers that despite movie depictions, there are reasons not to be afraid of sharks. She delves into their unique characteristics, and the organizations working to protect them. Much of the book is written in the form of question and answer. That enables young readers to follow easily, but it does break up the flow of the narrative. This book is laid out more in the form of a reference book or research tool. I don’t think that will deter readers who are fascinated by these creatures and would like a quick, comprehensive overview. The illustrations and diagrams vary in effectiveness because some are difficult to see. Recommended for animal enthusiasts and children seeking information for a research project.